Earth Overshoot Day marks the date when we, all the people living in this world, have used more resources from nature than the planet can renew in the course of the entire year. In 2018, Earth Overshoot Day falls on August 1st! Meaning we spent all our yearly resources budget in just seven months. How is this possible? How is it calculated? Alex, from Sustainability Illustrated, explains. The Global Footprint Network uses a rigorous and transparent process of data collection and analysis to illustrate the dramatic trend of increased use of natural resources in our planet and create awareness of the consequences our careless consumption behavior bring. Awareness backed by solid metrics is the first step to creating actionable plans and strategies. According to the data, we are now living as if we had 1.7 earths, but the spotlight on sustainability, climate change and other environmental issues in the last decades seem to be bearing fruits and slowing down the trend of having Overshoot Day move back almost a month per decade. #MoveTheDate is a global campaign, a worldwide effort, not only create awareness of Earth Overshoot Day but also to put ideas and solutions to the test, at all levels, from personal behavior to the private sector and world governments. Take a step to #MoveTheDate and be a part of the solutions. 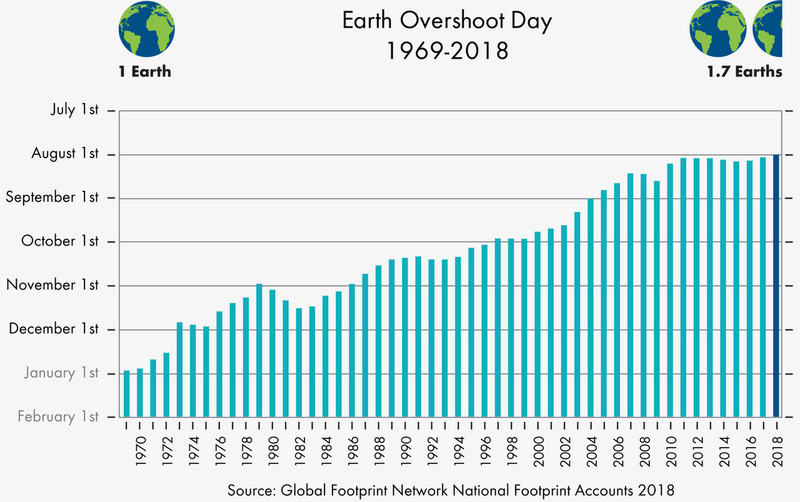 We invite you to learn more about Earth Overshoot Day, calculate your own personal overshoot day and join in the conversation! Earth Systems Thinking: Global Consumerism, Climate Change, and the Spiritual Value of the Earth.